How many times a day do i feed my 2 month german shepard? how many times a day do i feed my puppy.she is two months.she picks up everything on the floor.is she hungry? 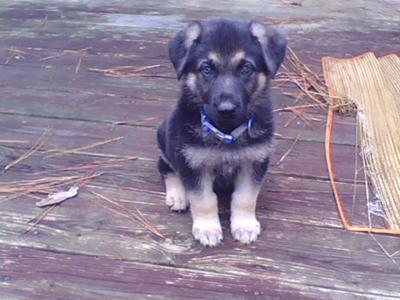 Total German Shepherd: Puppies of any kind, including German Shepherd puppies , explore the world with their mouths. So don't be surprised when your puppy picks things up around the house or wherever. But that doesn't necessarily mean she's hungry - just curious. As far as how often you should feed her, I would encourage you to feed her at least 3 or 4 times a day if you can in small meals. Remember, she's still a baby and babies need to eat often in small meals. As she matures you'll be able to cut down the number of meals but even as an adult I would encourage you to feed her at least twice a day. Why? Well, for a number of health reasons. More info on feeding German Shepherds can be found throughout this website.